Easy Dinner Recipe For Two – She Cooked Seafood Pasta – Eats Yummy! My girlfriend ex-girlfriend, Ana, loves to cook. 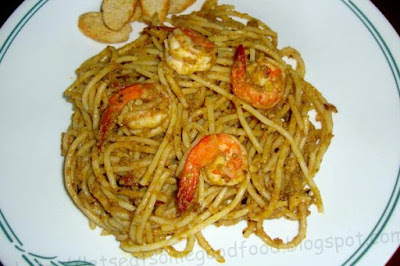 Thinking of an easy dinner recipe for two, we decided to cook Aligue with Shrimp Pasta Recipe. Since it is one of her specialties, it will surely be delicious and easy to cook. Well, we both love seafood and pasta because it is so easy to cook and so tasteful. Although we also love other easy cooking recipes for beginners, this one has a unique taste having crab fat as a sauce instead of red tomato sauce that is common in Filipino spaghetti recipe or white cream sauce being used in pasta carbonara. Prelude to above, I was just bumming around in my house back then and was looking for places to eat. Ana and I were thinking of an easy dinner recipe for two, and she asked me if I want this one. Of course, what else to answer but a cheerful, yes. I told her that this is also one of my favorite pasta. Not to mention how we both love seafood, shrimp recipes, and crab recipes; We better include this easy food recipe for dinner in our healthy dinner ideas list. So we decided to meet at the nearest mall then. We had some strolling and window shopping to kill time. We bought ingredients and headed home when we felt that we’re hungry and almost time for dinner. Shrimp dinner ideas are something we should not really delay. After half an hour of traveling from the mall to my house, we found ourselves at my house cooking this tasteful and easy pasta recipe. We then ate the fruit of labor afterward. Verdict? Don’t ask me more if it tasted good, hell yeah it does! And this started my first blog post and a way to share recipes and foodie experiences through our blog- Good Food Blog which we recently changed to Eats Yummy! For easy home cooking recipes, feel free to check other posts that we have. Try it and share your experience in the comment box. We love to hear your thoughts about quick shrimp recipes.